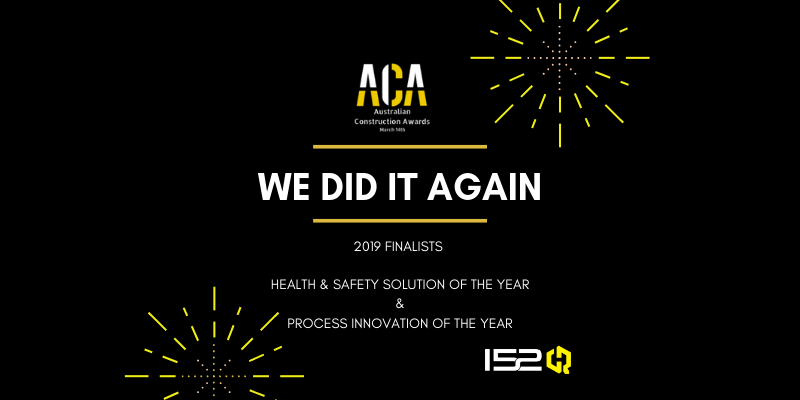 Wow, not 72 hours after hearing we are finalists in the Australian Construction Awards, but we receive notification that we are also finalists in the Hunter Valley Safety Awards 2019. The team at 152HQ have done it again. 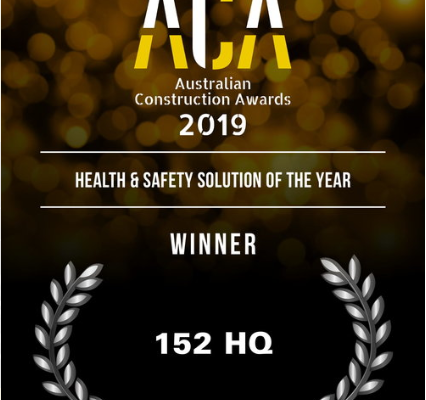 It was announced that we are finalists in the Australian Construction Awards for 2019. 152HQ is honoured to be finalists in not one but two of the Australian Construction Awards. Providing a safe working environment is vital. This award celebrates the outstanding contribution to improved H&S in the industry, whether through a specific product or through process adaption. They say there is a method in the madness, but this award focuses on how companies have developed working methods to show greater efficiency or have see a substantial improvement in profits as a result of the new process. We look forward to attending the awards ceremony on March 14th as part of the Sydney Build Expo. Make sure everyone on your team gets home safe with Safe-halo. “Moving towards a towards a smart phone app was just seamless.” Kane Organ, Peabody Energy, Metropolitan Mine. How do you make sure everyone on your team gets home safe? 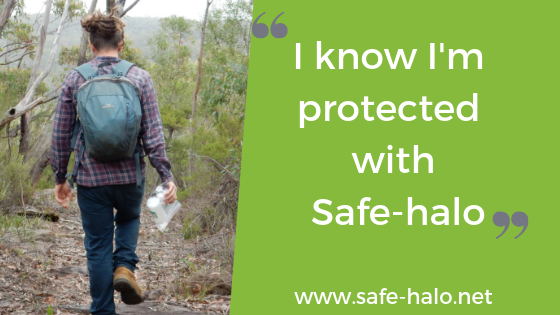 Find all of Safe-halo’s great features at www.safe-halo.net or call us for a demo on 1300 965 195. Welcome to TBT (Throw Back Thursday) where we look back at our software successes! This week’s spot light is on 152HQ, being awarded Gold Disruptor for 2018 at the national ACS Digital Disruptor Award for Service Transformation for the Digital Consumer: Corporate. This award is recognition of how 152HQ with Safe-halo have digitally disrupted remote worker management systems. As award recipients, 152HQ are honoured to be recognised as a team of ICT professionals who are at the forefront of digital innovation. Contact 152HQ at 152HQ/contact-us or call on 1300 965 192 to see how our award winning team can turn your digital dreams into reality. can store location coordinates to the device, in times of intermittent signal, which are transferred to the database, as soon signal is available. and most importantly, do not need their IT departments permission to implement nor seek funding for additional hardware, software, data storage or training. These operating systems are much like a bear hibernating for winter – A bear will slow its heart beat and metabolism down to only just achieve what is needed to keep it alive. The operating system does the same in your phone. The system will wake up if the phone senses movement or it is triggered by something like an incoming call or text. It will continue to operate at 100% until your put the device down again. 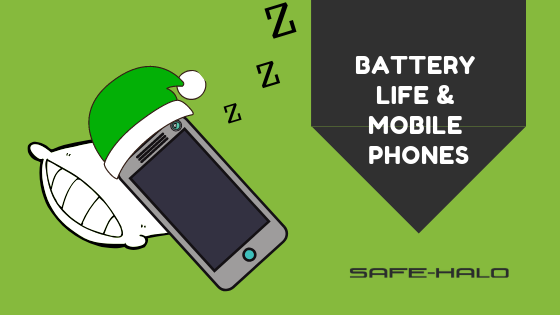 When Safe-halo is turned on it will track the owner, even when the phone goes to sleep. The tracking data is stored on the device and relayed back to the Safe-halo management system as soon as the phone has been woken up and has phone or internet signal. Safe-halo has been designed for Users in the field, knowing that these Users are active and on the move. When Users are active or moving their smart devices are awake. Hence Safe-halo is extremely efficient at doing is task. The number 1 question we are asked is, “Why is my location sometimes shown wrong on the map?” 95% of the time this is because the device has gone to sleep, while sitting on a desk, in a daypack/bag or the User has been out of network range. The map shows the last known location for the device. Safe-halo will continue to store the GPS coordinates on the mobile device in preparation to upload to the server, as soon as the device is awake, and signal is available again. We have now included additional design features within Safe-halo, that both manually and automatically wake the device up remotely from the webserver. Safe-halo is now able to “ping” the device. A feature that is super advantageous when a user is in the field and has not moved within a period that they should have. We also recommend that users of the Safe-halo app regularly log out and login of Safe-halo (every couple of days,) as each time you do this, the app will complete a “handshake” with the server ensuring that all information is keep up to date. Please note that the schedule function on the app is designed to turn the app on and off, it does not automate data updates. If you have any questions or require further information about how Safe-halo can safe guard your employees, please contact the team at 152HQ on 1300 965 192. Safe-halo is a cutting-edge remote worker management system. Protect and monitor your workforce today. Take our free 30-day trial today! 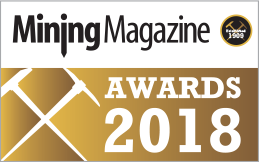 We are honoured to be nominated in the Safety category for @MiningMagazine Awards 2018. Vote here https://promo.miningmagazine.com/awards-voting2018/ for @152_HQ’s automated Remote Worker Management System – Safe-halo. 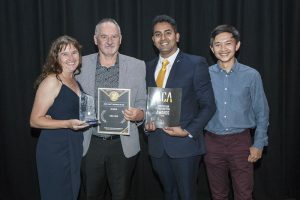 Exciting times at 152HQ, as we were awarded Gold Disruptor for 2018 at the national ACS Digital Disruptor Award for Service Transformation for the Digital Consumer: Corporate. 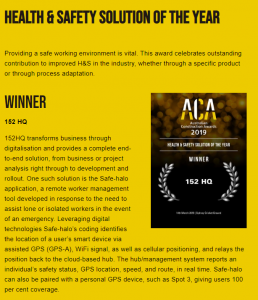 This award is recognition of how 152HQ with Safe-halo have digitally disrupted remote worker management systems. The ACS is the professional association for Australia’s Information and Communication Technology (ICT) sector. ACS is passionate about the ICT profession being recognised as a driver of productivity, innovation and business that can deliver valuable, tangible results. The Safe-halo application is able to enhance a user’s smart device, enabling the GPS signal to still be sent from the very outer fringes of network range. The device then reports a User’s safety status and location back to a web based management system. This week 152HQ are also excited to announce that we can now link Safe-halo to personal GPS tracking devices, such as Spot 3, offering users 100% coverage. Safe-halo is successfully implemented into South32, Centennial Coal and Peabody Energy operations within New South Wales, offering real time visibility and peace of mind when it comes to remote worker management.